I’m not talking about scary big people that live at the top of a fairy tale beanstalk or even the happy kind that sell vegetables. I’m talking about the giants that you and I face repeatedly in our lives. The invisable giants that rise up in many shapes and sizes. They are bigger than life because–with their unseen nature– we attach fear and anxiety to their weapons, adding to their armament and allowing them to control us. The most well known giant story would arguably be the account of David and Goliath in the book of I Samuel in the Old Testament. Of course, the story ends with David’s complete trust in the power of God and the death of Goliath from the stone thrown from David’s sling. Fierce, foreboding and terrible as he was, he was no match for God. When we come face to face with the giants that approach us, we must pray about them intentionally. 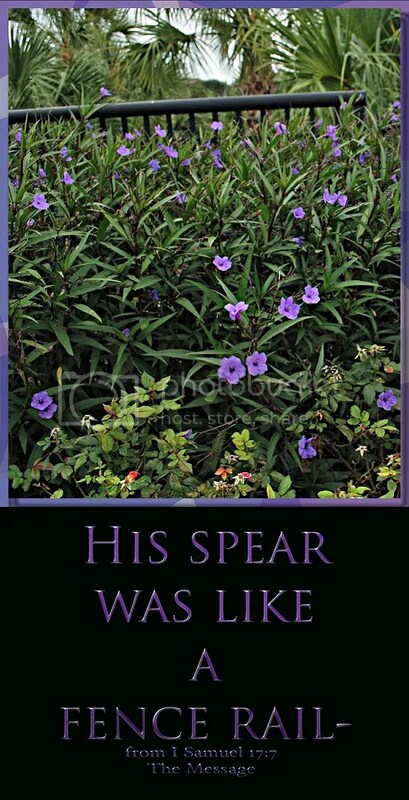 Even if the "spear" of the situation is bigger than a fence rail—God is still in control.